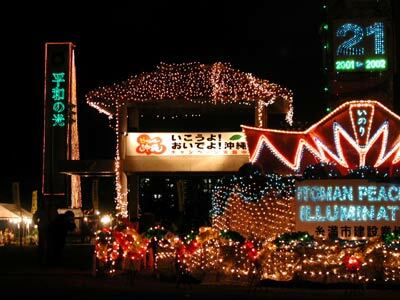 Tens of thousands will visit Itoman in coming days to see the most spectacular holiday lighting display on Okinawa. Now in its sixth season, the Itoman Peaceful Illumination Celebration opens today at Nishizaki Shinsui Park on the city’s Westside. 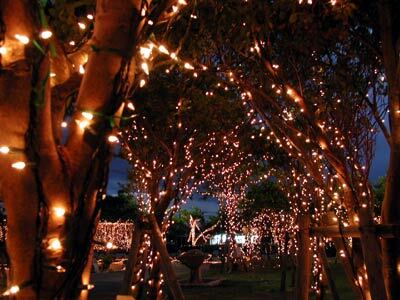 The festivities run through January 1st, when lights are turned off. The celebration’s lights are on daily from 6pm to 10pm. More than 1.3 million light bulbs are set in the trees and draped from buildings and bridges in the park, with sensational reflections shimmering off the park’s ponds and pools. An estimated 100,000 visitors will trek to Itoman during the ten-day run. Entertainment each evening runs the gamut from local groups performing diverse styles of music, to Eisa, Taiko drummers, and more. Folk performances and public Christmas activities offer something special for each evening. New Year’s Eve will feature a countdown concert, followed by fireworks. 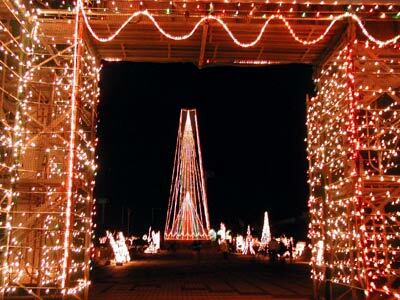 The Itoman lights are spectacular, so be sure the cameras have plenty of batteries, memory sticks and/or film. Take Highway 58 to Naha, then continue south to Itoman City. The highway changes to 331 after passing Naha Military Port. Approaching Itoman, follow signs to Nishizaki Athletic Park. A landmark for the right turn to the park is the Esso gas station at the third traffic light in the city.